See how happy my son for his first Kiddie Crew Workshop. 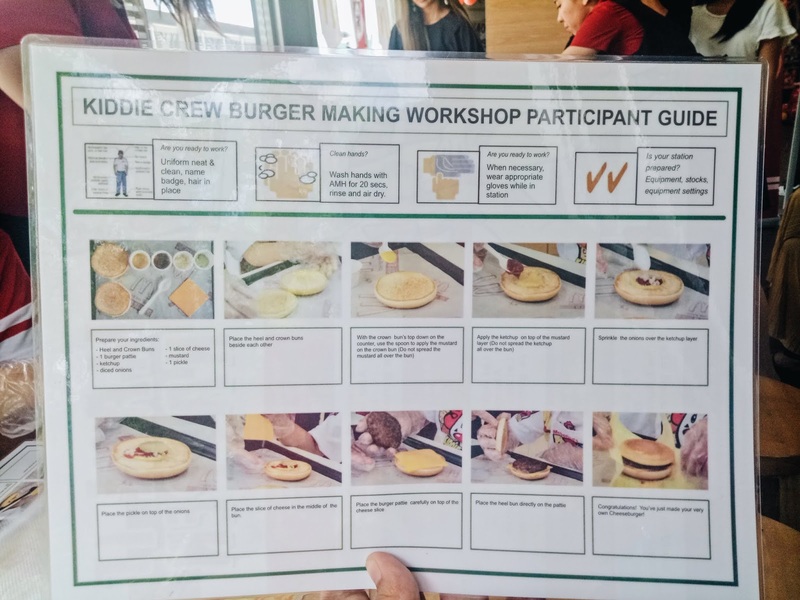 This enjoyable and learning summer activity of Mcdonald's started since 1991. It's basically a year older than me. But when I was young I never experienced something like this, which is why I am trying my best to have my son experience it. Last April, my son joined a 1 day workshop/launched of Mcdonald's Kiddie Crew. Just a little bit of fact, Mcdonald's has already 570 branches all over the Philippines. So no matter where you live, I'm sure there's a nearest Mcdonald's at your place. Going back, when we arrived, they provided us our Mcdo shirts, bag, cap and ID for the said workshop. All the staffs are very accommodating and gave us refreshment drinks before we start. When the program started, they first discussed what the kids can get for joining this workshop and the activities they will go through for 5 days. They announced the good news where kids can now join for a weekend workshop. This is perfect for working mommies and daddies who can't take a leave or want to accompany their kids. Check out their workshop dates. They have workshop until June 15. The price is very affordable. For Weekday workshop, it's ₱695, while Weekend workshop is ₱595. After the short introduction, kids were grouped to two batches and started with the activity. The first activity is burger making. This one is very easy and they are given instructions clearly. The kids look cute with their chef hat and apron. Sharing some photos of my son during burger making. TADAAA! Parang regular cheese burger na dinidispatch talaga. You'll never know the kid did this. His gutom na ako tama na picture look! Enjoy na enjoy siya kumaen ng burger niya. Actually this workshop is remarkable to him. Tuwing nakakakita siya ng burger, lagi niyang naaalala na gumawa siya ng burger sa Mcdonald's and I can feel he's very proud of it. Next is the tour inside the pantry, act like a crew at the counter and crew at drive thru. I wasn't able to take photos because he got hysterical nung pumasok sila sa pantry when he can't find me. It's his first time and I understand he's a bit shock. But the other kids really enjoyed it. They interact with the customer and other staffs while learning how Mcdonald's operate. Then last but not the least, happy meal box coloring activity. This one, Prince is very familiar with it because I usually buy him happy meal almost twice a month. Parang tuwing kada sahod o kaya may magandang toys. 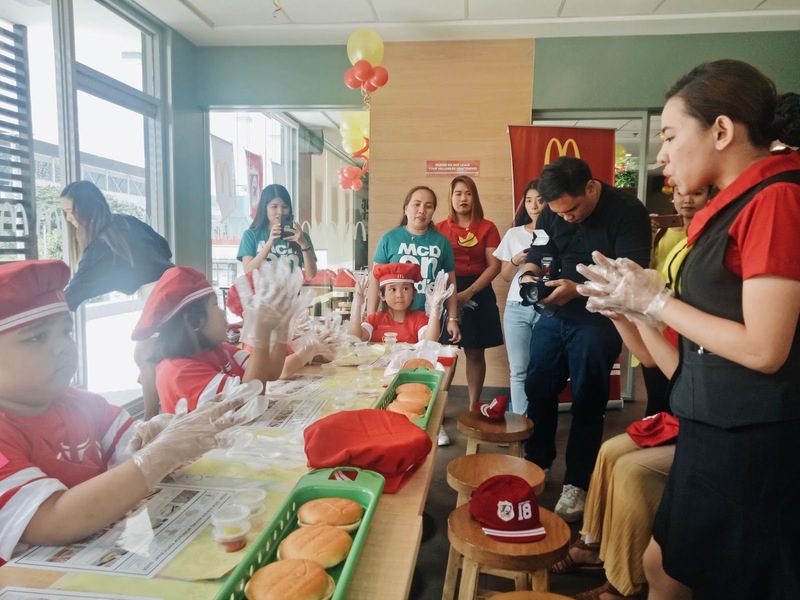 After doing the 3 activities, kids enjoyed their bonding time with Ronald of Mcdonald's. Ronald taught them his easy dance steps and kids groove and move their body. Ending the program with a class picture. Overall, we had a blast and really had fun. Mcdonald's Kiddie Crew accepts 3-12 years old. But most of their activities are designed for 6-12 years old. If you like your toddler to try it, it's fine. They will ask for a guardian to stay with them. It's a good idea they have weekend workshops. For all the parents, if you want your kids to have a memorable summer, enroll them to Mcdonald's Kiddie Workshop. They accept participants until June 15 so grab it! You may visit the nearest store and fill up the form or you may visit mcdokiddiecrew.com.